The reports of levitations – of both humans and furniture – were abundant in the early research on mediums. Sir William Crookes, a world renowned chemist and physicist, reported seeing medium Daniel D. Home levitated (lifted) on three occasions, while also witnessing several other people levitated in Home’s presence. The Home levitations took place under lighted conditions and in Crookes’s home. Crookes even went to his knees and ran his hand under Home’s feet to rule out some kind of invisible wiring. Biologist Alfred Russel Wallace, co-originator with Charles Darwin of the natural selection theory of evolution, was present with Crookes at a sitting with Home on May 22, 1871 when a table was levitated several times. Crookes and Wallace went to their knees to verify the levitation and the fact that Home’s hands and feet were in no way involved, as skeptics claimed they must be. Well before Crookes studied Home, William Makepeace Thackeray, an esteemed British author, told of his observations of some Home phenomena, including Home floating in the air above the heads of those in the room at a dinner party and of the heavy dining room table, covered with dishes, decanters, and glasses, rising a full two feet above the floor. Lord Adare, one of Home’s biographers, reported with his father, the Earl of Dunraven, an archeologist and member of the Royal Society, on a number of sittings they had with Home between November 1867 and July 1869, (Experiences in Spiritualism with D. D. Home). Before any phenomenon occurred, Home would go into trance and spirits would often speak through his vocal cords. In the 40th sitting, during December 1868, a spirit began speaking through Home, saying that he would “lift him” on to the table. “Accordingly, in about a minute, Home was lifted up on to the back of my chair,” Adare recorded. “The spirit then told Adare to “take hold of Dan’s feet.” Adare complied, “and away he went up into the air so high that I was obliged to let go of his feet; he was carried along the wall, brushing past the pictures, to the opposite side of the room.” After Home was deposited on the floor, the spirit commented that the levitation was badly done and said that “We will lift Dan up again better presently….” However, he was not raised again that night as some other spirit wanted to speak through Home and the spirit who had lifted him gave way to this more advanced spirit. Home, who recalled a feeling of “electrical fullness” about his feet when being lifted, was usually lifted up perpendicularly with his arms rigid and drawn above his head, as if he were grasping the unseen power raising him from the floor. At times, he would reach the ceiling and then be moved into a reclining position. Some of the levitations, it was reported, lasted four or five minutes. But Home was not the only medium in whose presence the spirits lifted people or furniture. Dr. Cesare Lombroso, a world-renowned neuropathologist known for his studies in criminal behavior, reported that on September 28, 1892, he was seated on one side of medium Eusapia Palladino and holding her hand (for control purposes) while Professor Charles Richet, later a Nobel Prize winner in medicine, held her hand on the other side. As Lombroso explained it, Palladino, while in a trance state, complained of invisible hands grasping her under the arms. Then her voice changed and said, “Now I lift my medium up on the table.” Palladino was then raised in her chair to the top of the table amid groans and lamentations on her part. The researchers then observed her deposited back on the floor with the same security and precision. The voice speaking through Palladino’s vocal cords was said to be that of John King, her spirit guide who reportedly took control of her body during her trance states. A similar levitation was reported to have taken place on May 25, 1900 with Enrico Morselli, a neurologist and professor at the University of Genoa, controlling Palladino’s hand and foot on one side and Professor Francesco Porro, a world-famous astronomer, controlling on her other side. Morselli reported that Palladino was raised to the top of the table “in such a way that her feet and two front legs of the chair rested on the surface of the table,” after which she groaned, as if intensely frightened, and then asked (apparently John King) to be placed back on the floor. As she was descending, she “was carried up again,” before being lowered to the floor. This all took place under dim but adequate lighting. Of course, the closed-minded skeptic would say that Home, Palladino, other mediums producing levitations were all tricksters or that everyone present was hallucinating or had been hypnotized. “Spirit is the last thing I will give in to,” said Sir David Brewster, another famous scientist who witnessed a table levitated in the presence of Home. Brewster claimed that it had to be a trick, although he had no idea as to how the trick was performed. In 1914, Dr. William J. Crawford, a mechanical engineer, began carrying out experiments with Irish medium Kathleen Goligher. Crawford brought in a scale large enough to hold the medium while she was sitting in her chair. He discovered that when a table was being levitated, the weight of the table, usually around 16 pounds, was transferred to the medium through “psychic rods,” apparently formed by the ectoplasm given off by the medium, what Crawford referred to as “psychic force.” Most of the time, the transfer of weight would be a few ounces short of the weight of the table. Further experimentation revealed that the extra weight was being transferred to the sitters in the room, who apparently furnished small amounts of the psychic force. Crawford pointed out that he continually worked under the levitated table and between the levitated table and the medium and conducted many of his experiments in adequate light, although it became obvious to him that light affected the rigidity of the rods, i.e., the rods could not be made stiff if strong light was playing upon them. During his 87 sittings with Goligher, Crawford made a number of other observations, including that the psychic rods could extend only about five feet from the medium’s body and that it often took a half hour for the psychic energy to build up. He further observed that the psychic energy often caused the medium to make slight involuntary motions with her feet – motions which might suggest fraud to a careless observer. “I have come to the general conclusion from the results of my experimental work, and from observations of the circle extending over two and a half years, that all the phenomena produced are caused by flexible rod-like projections from the body of the medium; that these rods are the prime cause of the phenomena, whether they consist of levitations, movements of the table about the floor, rappings, touchings, or other variations,” Crawford wrote. In his 1874 book, The Book on Mediums, Allan Kardec, a pioneering French psychical researcher, told of a conversation he had about levitations with the spirit of St. Louis. Whether it was actually St. Louis or a “group soul” identifying itself as St. Louis (see prior blog post on group souls) is not clear, but the explanation appears to be consistent with what Crawford and other researchers later came to understand about levitation. It was further explained to Kardec that those who produce such physical phenomena are inferior spirits who are not entirely disengaged from all material influence. Being “inferior,” however, did not seem to imply that they were evil spirits, only that they had not yet advanced enough to be free of material vibrations. But it was further explained that the more advanced spirits can make use of the inferior spirits just as humans make use of porters. I realize that you no doubt have a will to disbelieve and nothing will change your mind, but to set the record straight, at least one of D. D. Home’s levitations was done in broad daylight. That took place on March 4, 1869 at Adare Abbey and was witnessed by Lord Adare, his father, the Earl of Dunraven, and Captain Charles Whynne. They reported that he floated about 30 feet over a two-foot wall. Then again, perhaps the bright sun blinded them and they just imagined it. As for the observations by Crookes, Wallace, Richet, and many others, what records do you have to say that the lighting wasn’t adequate? Should all scientific experiments carried out in indoor laboratories be questioned because they were not in outdoor daylight? Believe what you will, but hopefully you won’t believe in meteorites, since no single meteorite has ever been replicated. 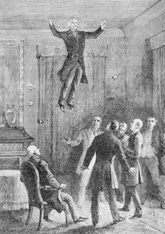 The problem is that all these alleged levitations occurred in dark rooms, or rooms with little to no lighting source. None of these levitations ever occurred outside in broad day-light. Sense perception is weaker in dark conditions. All these eyewitness accounts in dark suggestible conditions are based on human testimony which are fallible. As for these witnesses - Cesare Lombroso had arteriosclerosis, he was not in the best of health. He was also short-sighted. In a pitch black room with Eusapia Palladino he was obviously easily duped. The seances with Daniel Dunglas Home were also never performed in pure light conditions. In conclusion there is nothing scientific in this post. If levitation was real it would have been observed by now in broad day-light all around the world. Common sense and everyday sense experience shows us these things are impossible, they defy everything we know about reality including several laws of physics. They have never been observed in real life or inside a scientific lab under repeatable conditions. Anecdotal evidence from biased witnesses and spiritualists in dark seance rooms written over 120 years ago is not evidence for the paranormal, it is evidence of human gullibility. Personally, I have given up trying to understand what God is or isn’t, what reincarnation really involves, what spirit “individuality” really means, and how states of mind differ from places, etc., etc. I find considerable comfort, however, in the idea that consciousness survives death and in the communication coming from various spirits that the spirit world is far beyond what we are now experiencing and can imagine. The gist of all the communication is that consciousness does survive death, but it does not survive in the humdrum heaven and horrific hell that orthodox religions have given us. It is a much more dynamic afterlife. That at least offers some purpose, hope and peace of mind that many thinking people don’t get from established religions. The material world each of us experiences obeys the laws of physics. Your quote from Kardec states that we are each deceived by this. Thus we are amazed by levitation and other phenomena that seem to defy the laws of physics. If what we are experiencing as an actual physical reality is actually a virtual reality, as Kardec indicates, then any action that seems to defy the laws of physics involves merely a mental process involving a different set of rules. In our interaction with each other in this virtual reality we seem to use our vocal cords to talk with each other, and our eyes for seeing, and yet in our dreams and OBEs and NDEs we communicate with each other telepathically, we see without our eyes, and we move around simply by thinking of where we want to go. Hard for us, for me, to accept convinced as we are by the reality of the physical world. Padre Pio, as you know, was a great levitator. So too have been countless Gurus, some of whom have taught their disciples to levitate. Excellent article. I believe enough credible witnesses have testified that levitations and other physical phenomena exist. to effectuate spiritual physical phenomena is to use a combination of the energies of spirits (with lower vibrational, more materialized energies/perispirit/vital fluids) from in the spirit world… with the energies of people living in the material world, with the universal fluid as necessary. Further, some people have energies/perispirit fluids/vital fluids that are more conducive to assist in producing physical phenomena…of course, with… strong willpower and focused intent involved, and overseen by the superior spirits always. That is as far as I go. I think that is as much as we humans can truly know and understand about the process. we get really into unknown territory. Many of these more materialized spirits believe they are actually doing “physical things” like playing piano with fingers (ex. when they don’t have any fingers) and so they describe their actions in material/physical terms. I believe these descriptions confuse what is truly going on. We have to be cautious about what we accept so we don’t build theories upon things we really don’t know or are still not able to comprehend. Thank you for those comments. I wasn’t aware that David Thompson had been levitated that high. “My dining-table is of mahogany, very heavy, old-fashioned, six-feet wide, nine-feet long. It stand on a Turkey carpet, which much increases the difficulty of moving it. A subsequent trial showed that the united efforts of two strong men standing were required to move it one inch. There was no cloth upon it, and the light fell under it. No person was in the room but my friend [Mr. Moses] and myself. Another great post Mike. Virtually all the physical mediums we have sat with are levitated while stapped into heavy chairs at the end of a seance - it seems to be to discharge the energy. David Thompson has been levitated chair and all over the heads of sitters sitting in a circle and deposited many feet away on the other side of a large room. In the home circle when the spirit team was deveoping levitation David would be lifted up in the chair with his head almost touching the ceiling and held aloft for several minutes. On one occasion he was brought out of trance and was talking and laughing with us while Victor was able to feel around the bottom of the chair legs and David’s feet. What a very interesting piece, Mike. Thanks for that. Of course, there are many other examples of levitation. I remember that William Stainton Moses was levitated three times and his table moved despite its great weight, but no investigation into the phenomenon was as thorough as Crawford’s. Has there ever been an attempt to make a comprehensive list of all the mediums who achieved levitations? Such a list would give something for sceptics to chew on.